Following a series of successful seminars with business executives in Zimbabwe and African parliamentarians in the Seychelles in 2012, the Negotiation Lab Limited set up a subsidiary operation in Africa, called the Afrikan Negotiation Lab. The aim of the Afrikan Negotiation Lab is to enhance the leadership potential of a new generation of post-graduate students, business executives and government leaders as Africa expands both its regional economic ties and its global presence. The Negotiation Lab, in association with the UK-based non-profit company Critical Discussions, started its activities in Africa with a two-day Basic & Advanced Negotiation Workshop as part of the Mandi Rukuni Seminar series at the Wild Geese Lodge outside Harare, Zimbabwe on May 10-11, 2012; and again at the Holiday Inn in Harare on July 30-31, 2012. It also held a one-day workshop on Negotiating with the Chinese at the Bronte Hotel in Harare on August 1, 2012. The 29 participants in the three workshops were businessmen and women, representatives of NGO's and academics, all from Zimbabwe. Twenty of the participants were from OK Zimbabwe Ltd., one of the largest local retailers in the country, who among other things, operate the "OK" and "Bon Marche" supermarket chains. The Managing Directors of Curverid Tobacco Ltd. (part of the German CNT Group) and Manica Zimbabwe Ltd., a freight & logistics firm, took part in a new one-day workshop on Negotiating with the Chinese. 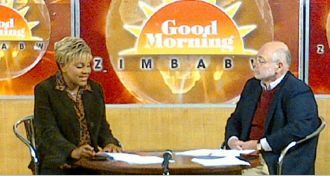 Samuel Passow, Founder & Managing Director of the Negotiation Lab being interviewed on the Zimbabwe Broadcasting Corporation (ZBC-TV) morning TV news program, "Good Morning Zimbabwe" on July 30, 2012.